Hand-Picked Treasures For Our Customers! We search high low - yard sales, estate sales, antique shops, and more - all to find treasures we can bring to our customers (we also make some things ourselves buy things wholesale). We love repeat customers, so honesty and accuracy are important to us! Be sure to check out our complete inventory at dm-treasures.biz Vintage (1950s) Windsor Bone China (England) Teacup (No Saucer) This in not Royal Windsor, and it was hard to find examples of this English porcelain maker's products. I did find some information (see below). In any case, this is a pattern I could not find anywhere. It is a scene with a woman in a garden dressed in Victorian style, wearing a yellow dress and large hat. The garden is full of colorful flowers and there is a wooden trellis arch behind the woman. The cup ( sorry, no matching saucer!) is trimmed in gold, and the mark on the bottoms indicates a date of the 1950s. 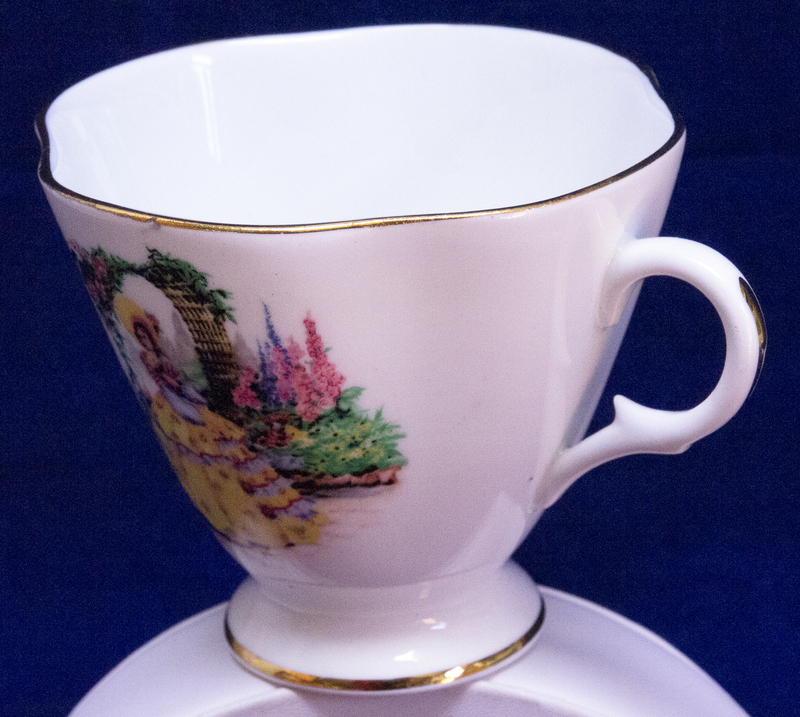 In addition to the mark, the bottom of the cup also has written in gold "713/52 X." Windsor was produced by the Co-operative Wholesale Society Ltd Crown Windsor Pottery, Longton. 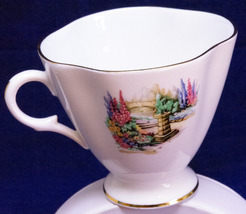 Staffordshire Potteries with different printed marks from 1946 to early 1960's. 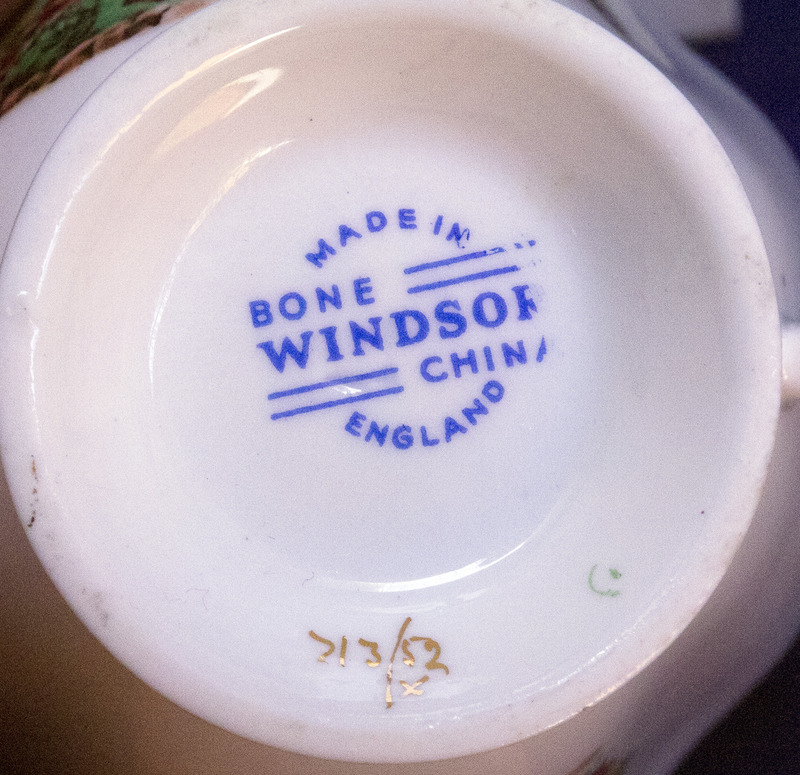 They also produced Clarence bone china. Condition Condition is excellent except for one small flaw - there is a tiny spot of disco;oration on the rim of the cup, just above the woman's head. This black spot feels like a very small chip. Satisfaction Guaranteed! Shipping All our items are carefully wrapped and packaged in appropriately-sized containers for shipping. Domestically, we provide a choice between a generic Economy rate and an Expedited rate, usually via USPS or FedEx, but we reserve the right to choose the least expensive carrier for each rate. Usually we prepare the package and ship the same day you pay for the product, and we do ship internationally. After we ship the product, you will receive the tracking number. We normally use USPS First Class International for international shipments. Payments For easy and fast transactions, we accept PayPal only. Returns All our items are guaranteed to be accurately condition rated and described! Please contact us first if the item you receive does not meet your expectations. If you are unhappy with the item for any reason, it can be returned for a refund of the full amount you paid, including postage (within 14 days of delivery). Unless the item is damaged on arrival or defective in ways not described in our listing, you will pay for the return postage. If damaged or defective, we will include the return postage amount (using the least costly shipping method available - please try to use the same packaging) in our full refund to you. We do not accept returns on international sales, unless the item arrives damaged or defective, in which case we will refund what you paid, including return postage. Contact us You can contact us on Bonanza.